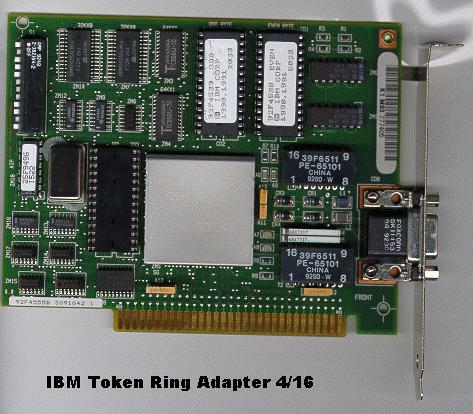 The standard ISA IBM Token Ring Adapter has a switch bank of 12 switches. On an IBM computer running a DOS or Windows 3.1 environment where the address range from E000-EFFF is used by the BASIC ROM and the address range F000-FFFF is used by the system BIOS ROM, the optimal settings for the Token Ring Adapter RAM is at DC00-DFFF and ROM is at DA00-DBFF. For clone PCs that have no BASIC ROM it would be better to place the adapter RAM and ROM as low as possible. The exact location depends on whether there is Video ROM present. It is even possible to tuck the adapter RAM and ROM in an unused video text area. Since most computers have a colour monitor, this is most likely the monochrome text area at B000-B7FF. The same settings can be used for the Microchannel IBM Token Ring Adapter 4/16 A, but the settings are configured with the reference utility, not switches on the adapter. These ROM locations are not documented in the manual packed with the IBM Token Ring card. In fact, the function of the switches to set memory locations aren't documented there. I have determined the switch functions by comparing the bit patterns of the two high-order bytes with the documented ROM locations, and extrapolated the function of the remaining settings from there. The behaviour of the card is consistent with these values, but neither I (Bob Jonkman) nor SOBAC Microcomputer Services will be responsible for any failures incurred through the use of the switch settings documented here. Only the Adapter ROM address can be set with switches on the Token Ring Adapter. The Shared RAM location is specified by a parameter on the command line of the token ring driver, or a configuration file. Some drivers (like TOKEN.LAN for a Netware server) will not allow alternate configurations, and expects the Shared RAM to be at the default D800-DBFF. In this case you should also configure the Adapter ROM to be at the default DC00-DDFF. Note that the Adapter ROM Address table is not exhaustive, but only lists the most common settings. All addresses in this document refer to segment addresses in upper memory (above 640 KibiBytes, below 1 Mebibyte). The following switch settings have been designed to optimize upper memory where E000-FFFF is unavailable. A NET.CFG file for these settings is available for workstations on a Novell Netware network. The memory addresses in NET.CFG refer to absolute addresses, not segment addresses, hence the extra zeroes. The following tables list the functions and common settings for each set of switches. ON OFF OFF OFF OFF ON B400-B6FF "Mono Text"
OFF ON ON ON OFF ON C400-C5FF "Low Cxxx"
OFF ON ON OFF OFF ON CC00-CDFF "Video Cxxx"
OFF ON OFF OFF ON OFF DA00-DBFF "High Dxxx"
OFF ON OFF OFF OFF ON DC00-DDFF "IBM Default"
^ What are these units? This article now uses the terms "Kibibyte" and "Mebibyte". These units use the prefixes "Ki" (or "Kibi", short for "kilo-binary") to represent 210 (or 1024) and "Mi" (or "Mebi", short for "Mega-binary") to represent 220 (or 1,048,576). This reduces the ambiguity for computer-related terms, since the SI prefix "k" or "kilo" actually means 103 (or 1000) and "M" or "Mega" actually means 106 (or 1,000,000). See the Wikipedia entry for Byte/Prefixes for a list of all the binary prefixes.